In addition to receiving graduate, non-degree semester credits, students may earn Professional Development Certificates related to curricula content, classroom management, and teaching strategies. 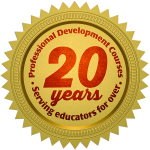 The Professional Development Certificate Program is primarily designed for classroom teachers and school administrators. This is part of the university's continuing effort to provide lifelong learning opportunities for educational professionals throughout the United States. The certificate is an acknowledgment of the extra effort put forth by our students to enhance the classroom learning environment and to improve professional skills and knowledge. Each certificate has a list of courses that qualify for that specific certificate. Students must successfully complete at least 15 semester credits (only Grades of A or B) from the course list for each certificate. Students can achieve multiple certificates, but courses are only applicable for the designated certificate, i.e., courses only apply to one certificate and cannot be interchanged for other certificates. Courses previously completed by students with a grade of A or B will be applicable for certificates in the category in which they have been approved. Students may enroll in courses singularly or in multiples, but enrollment cannot exceed 15 semester credit hours within any one semester. Courses must be completed within one year of enrollment, but there is no deadline for obtaining a certificate. Upon completion of 15 credits within an applicable certificate, the certificate will be awarded automatically. The certificate will be mailed to the student's address. Students may request the status of their certificate via the contact us form or live chat. There is no charge for the certificate, as the university is pleased to recognize your accomplishment. Professional Development Certificates are not designed to fulfill any specific district or state requirements.